Classes at your place or ours. Training can be provided at our facilities in Arizona, California, Missouri, Nevada, and Texas. Should you prefer, we can provide the same quality training at your location. The preservation of evidence is critical after a catastrophic incident occurs. Our team is on call 24/7 to respond to an incident on your behalf and gather information relevant to your defense. Let us accommodate your needs. Do you have special training needs? No problem; we can work to accommodate nearly any situation so that the program we deliver is one that works for you. Our mission is to serve. Premier Risk Management is a collection of best-in-class professionals practicing a variety of disciplines under the auspices of risk management. While most companies are directing their clients to websites and portals for assistance, PRM deploys a concierge approach to delivering our services, interacting directly with clients everyday. We work in close collaboration with them to identify risks in their work environment and then provide solutions to mitigate the probability of loss. Risk Managers use their education, training, and experience to make decisions that directly impact the strategic direction of a company. Their vision establishes long term objectives to meet a variety of corporate goals demonstrating exceptional leadership skills, efficient utilization of strategic alliances, and remain steadfast to their core values and well-disciplined reasoning. They lead a team of highly qualified professionals with individual expertise in many areas under the auspices of Risk Management. An invaluable member of any business team, they must possess a comfortable knowledge of internal business practices and understand the intricacies of an organization's trade or industry. The ability to identify deficiencies that could have a negative impact on a business is critical; providing solutions to mitigate these risks is quintessential. Risk Managers are recognized leaders who are dynamic, proactive and decisive. They adapt quickly to ever changing business environments and initiate proactive policies that resonate positively throughout an organization. Their communication skills are finely tuned; they are effective leaders, excellent project managers, and have the ability to derive excellence from all areas of a company. Human Resource Directors are the first line of defense in a company’s efforts to attract the most qualified applicants then retain those individuals to avoid negative trends associated with high turn-over. HR Directors are responsible for the development and implementation of recruiting, hiring, and retention systems that provide guidelines to managers with hiring authority. Responsibilities often include employee handbooks, compensation and benefit plans, Workers Compensation reporting and record keeping, employee records, disciplinary action, company exposure and medical records, back ground checks, employment verification, selection of third party service providers for substance screening and/or pre-employment physicals, and serves as a liaison between senior management and labor. Responsible for the direction and management of the organization's employee benefits program, the Human Resource Director develops and administers plans through coordination with professional consultants and technical experts in the legal, medical, actuarial, accounting, financial, economics, labor relations, and communications disciplines. The benefits program administration includes designing and financing the plans, controlling costs, communicating benefits to employees, and keeping abreast of government legislation affecting employee benefit plans. Employees are the most valuable asset to a successful organization; they also represent the greatest risk. Comprehensive studies are completed annually on loss information provided by companies throughout the United States. These independent analysis continually establish that less than 10% of all reported losses are related to engineering controls. That means that 90% of losses are the direct result of unsafe acts committed by employees. Another alarming trend is the short tenure of employees involved in catastrophic losses. Trainers are teachers with real world experience and unique delivery skills that allow them to communicate with employees regardless of education and/or comprehension barriers that may be encountered. Trainers can work in multiple environments and have the ability to develop training programs and select appropriate delivery systems that ensure comprehension of critical information. Trainer’s use a mixture of training techniques that may include classroom lectures, workshops, videos, and in some cases one-on-one coaching. Trainers devote a lot of time studying and preparing for programs and manage their systems well to ensure a tangible return on the training investment. Our trainers are versatile and provide a dynamic link between our customers and the professional development of their employee’s. Not only does this contribute to increased productivity and efficiency, but is a vital element in a healthy, thriving safety culture where the true value of your employees overall well-being is evident. Safety Directors develop and coordinate loss control efforts for their organization. They possess a unique set of skills, based on experience, to design programs aimed at the reduction of loss related incidents commonly associated with occupational exposures and illnesses. They provide reoccurring training, routine work environment inspections, skilled labor training, CPR and First Responder training, disaster preparedness, new hire orientation, Job hazard analysis, hazardous disposal procedures, and selection of appropriate PPE for worker protection. Safety Directors must remain resolute and tireless in their pursuit of a safety system that communicates the company’s expectations of employee compliance while providing solutions to everyday challenges presented by technological advances in a multitude of work environments. 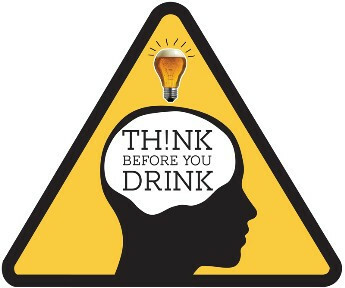 Alcohol Awareness Month organized by the National Council on Alcoholism and Drug Dependence (NCADD) as a way of increasing outreach and education regarding the dangers of alcoholism and issues related to alcohol. A big part of the work of Alcohol Awareness Month is to address the stigma that still surrounds alcoholism and substance abuse in general. Psych Central points out that denial is a major characteristic of alcohol abuse, both from the person currently experiencing it and from friends and family members who are uncomfortable acknowledging the gravity of the situation. Dedicating this month to promoting alcohol awareness is a chance to reach people who may not comprehend the dangers of unhealthy alcohol consumption. The National Institute on Alcohol Abuse and Alcoholism notes that 37.9 percent of college students engage in binge drinking; however, the danger of alcohol abuse goes beyond college students who get drunk at parties. Every year, 6,500 people aged 21 and under die from alcohol-related accidents, some of whom were not even drinking themselves. In addition to fatal accidents, alcoholism (at any age) contributes to higher rates of violence, sexual assault, and suicide. Going after people whose drinking creates a public safety risk costs the government as much as $114 billion every year, according to NCADD, though the human cost of alcoholism is much higher. When we raise awareness to the causes, signs, and effects of alcoholism, learn how to address drinking problems, and know where to go for help, we can make a profound and lasting difference ourselves. 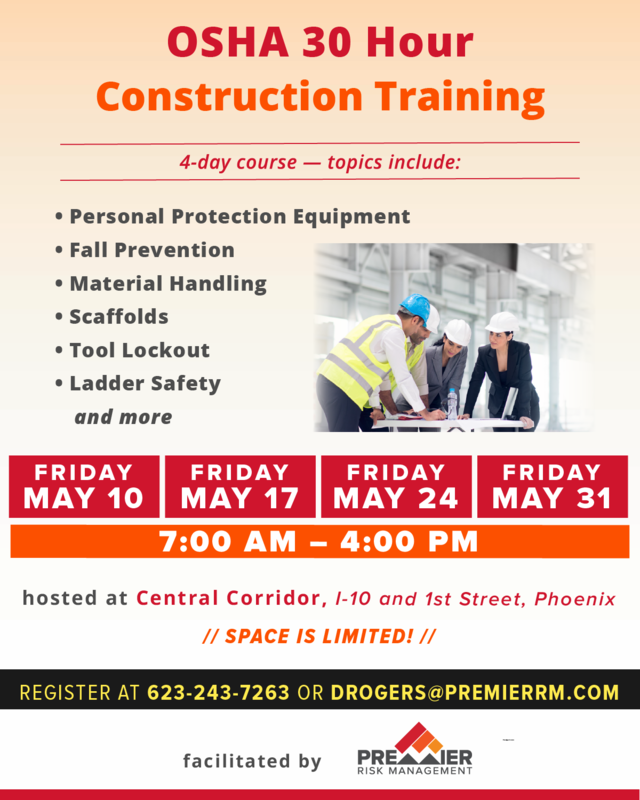 OSHA 30-hour Training in Phoenix 4-day course — May 10, 17, 24, 31 (7am–4pm) See flyer below for full details. The Cost of a Workplace Wellness Program: To Have or To Have Not? OSHA defines a Competent Person as “one who is capable of identifying existing and predictable hazards in the surroundings or working conditions which are unsanitary, hazardous, or dangerous to employees, and who has authorization to take prompt corrective measures to eliminate them" [29 CFR 1926.32(f)].” In short, the Competent Person has the ability to recognize and the authority to correct.